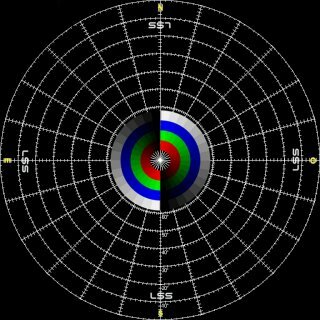 To master the adjustment of the optical systems, it is recommended to have the following pattern perfectly contrasted to get the best focus on all parts of the dome and also correct the tilt/brightness/contrast/color of the image. 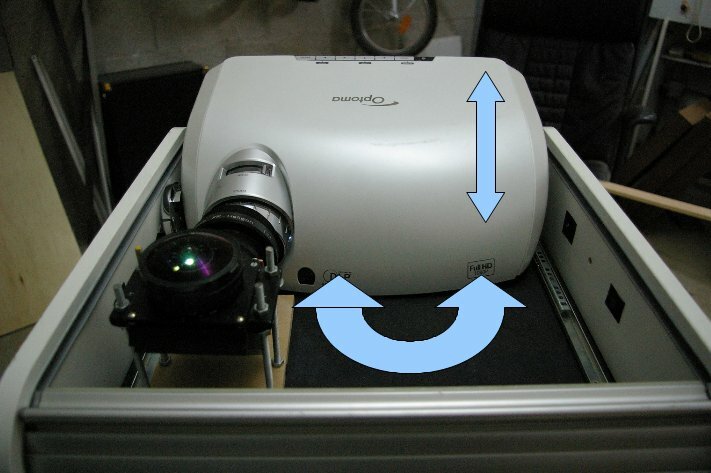 Because of the DLP technology and the need of most classical projection rooms, the image is not centered in the lense axis causing the image to be projected with an angle. To correct this in our case, the rear of most projectors should be raised to project horizontally. 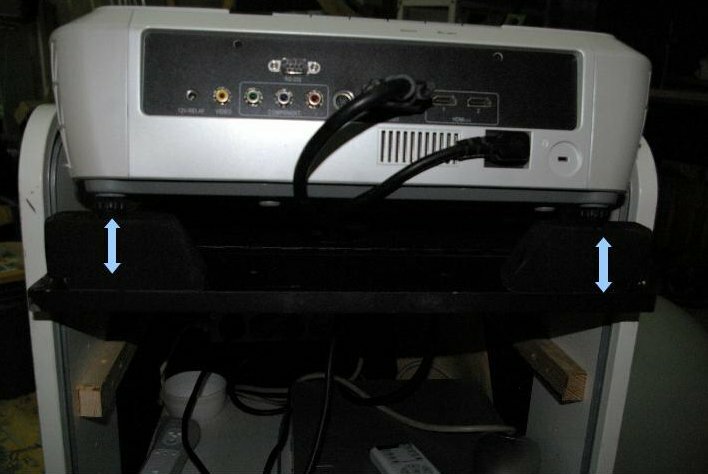 With some projectors, tilt corrections can be diminished with mechanical levers or software adjustments. Project on a small screen as a reference. 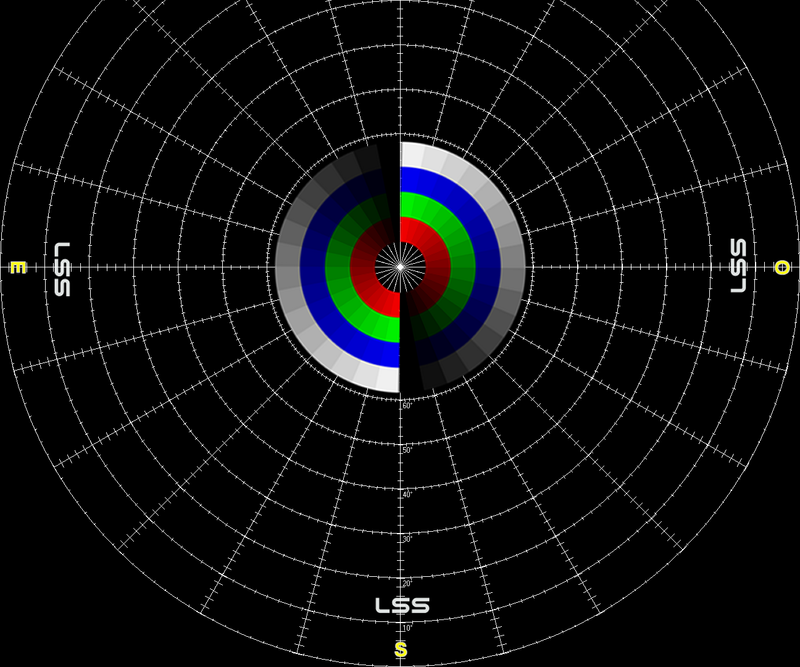 Put the altazimuthal grid and compass cardinal points on and suppress the atmosphere in Stellarium360. 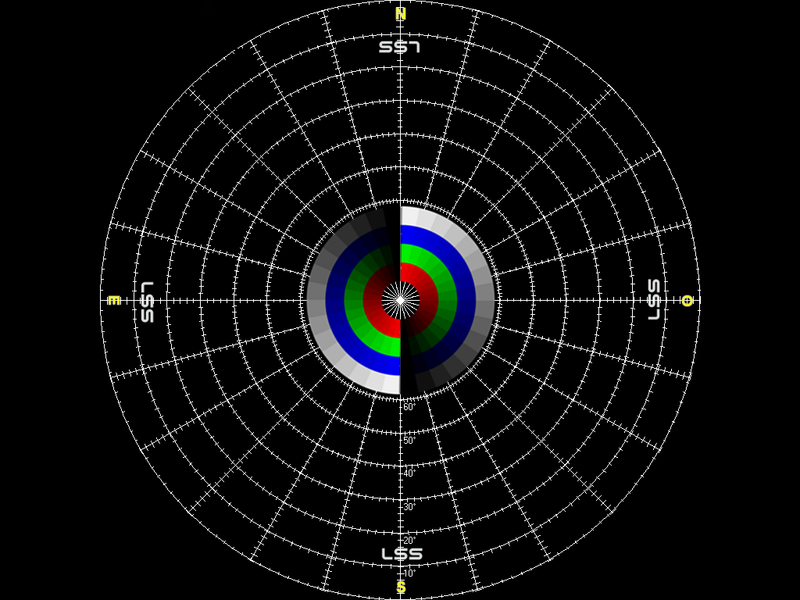 By moving the screen, the image should zoom in or out but the center and the E/O points must remain on the same line. If this isn't the case, adjust by tilting the VP, for example in using the adjustable feet. 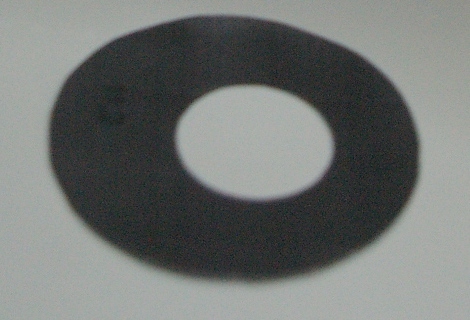 Adjust the height of the block so that the circular image is formed at the center of the lens. Warning, the four legs must be at the same height to avoid creating extra angle. Using a bubble level for horizontality can be useful. 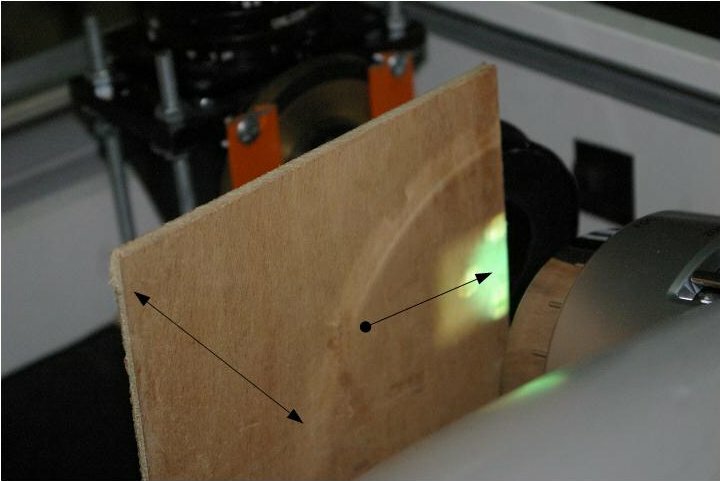 You can use a paper, masking with it half of the lens to see if the circular image is perfectly centered with the optics. 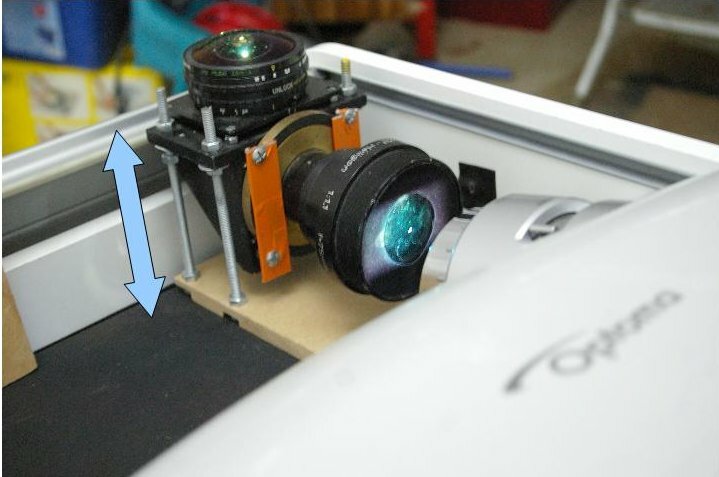 Depending on the type of Heligon or the camera lense, you'll have to put the block close to the projector. For others, you'll have to adjust the distance (between 10 and 15 cm for some Heligons). Try as much as possible to remain in the optical axis. When you place the optical block, most of the time it isn't aligned. The result is a staggered pattern onto the dome. You can help the adjustment with a translucent bulb for the setting. It's uncritical to be slightly shifted from the center of the dome. If the offset is too important, some parts of the picture will appear brighter than other parts (the side the projector is close to). According to the optics, you will discover that you have sometimes to cheat and reach a compromise, otherwise the edges will be sharp but the zenith will be blurred or sometimes only one side of the horizon. It's due to spherical aberration of the lenses. Two options: use a diaphragm or more radically change optical elements for something better. A basic rule: always check the horizon in front of you, not just on the horizon to your left or right. Sometimes the image appears blurred on one side, but when you shift to the opposite way, the sharpness becomes acceptable. Even with a Heligon condenser, the sharpness control on the entire image can be difficult. Most of the time, the horizon is sharp for 3 points of the compass (N, E, O), but not the last (southern). By changing the alignments, it merely shifts the problem. By using a Baffle at the entrance of the condenser, it's possible to improve the quality of the projection. Of course, you lose (a little bit) in brightness, but most projectors are almost "too bright", so a small loss is acceptable (you can compensate by setting up the level of intensity of the projector). How to build a Baffle ? With Open Office Draw, it's very easy to generate a page with circles of various sizes. Just change the properties of the inner circle: diameter and center, and print it all. For those not fluent software, here are some PDF files of Baffles. Then cut each drawing with scissors, following the best circular curvature. 1. 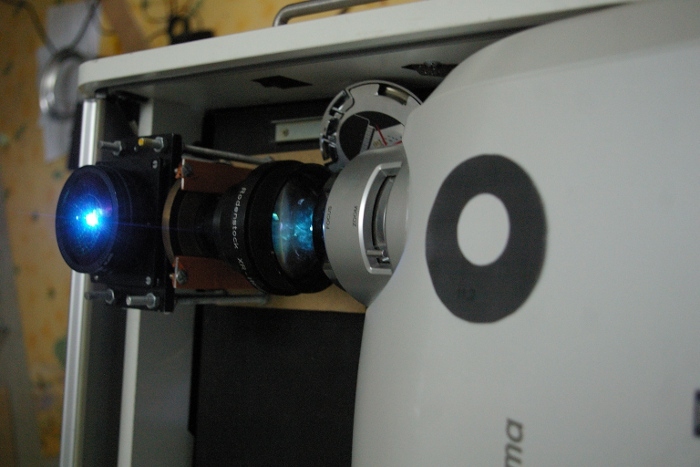 The optical beam must be nearly centered with the Heligon. The development must be done on the dome at the peak, using the grid altazimuth. 2. 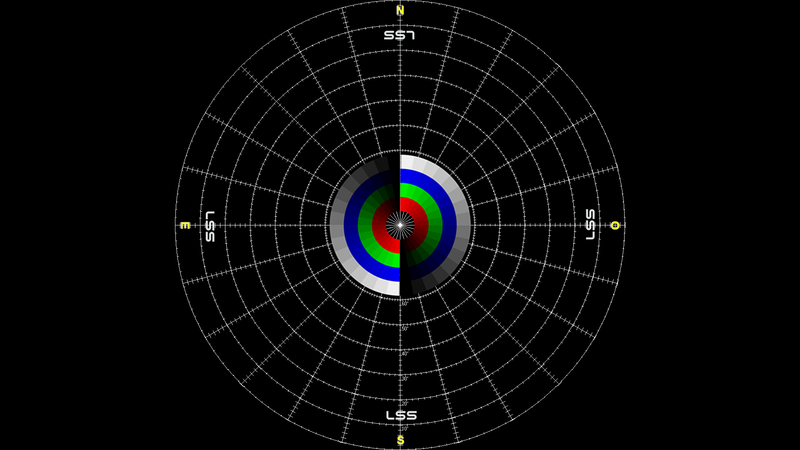 Using a centered Baffle, we get a clear picture on the horizon initially unclear, but the opposite horizon is then partly hidden. Make several trials with different sizes to determine the minimum diameter (5 mm). With Stellarium360, the grid will be visible on altazimuth 360 at height 0 (do not forget to remove the landscape and atmosphere). 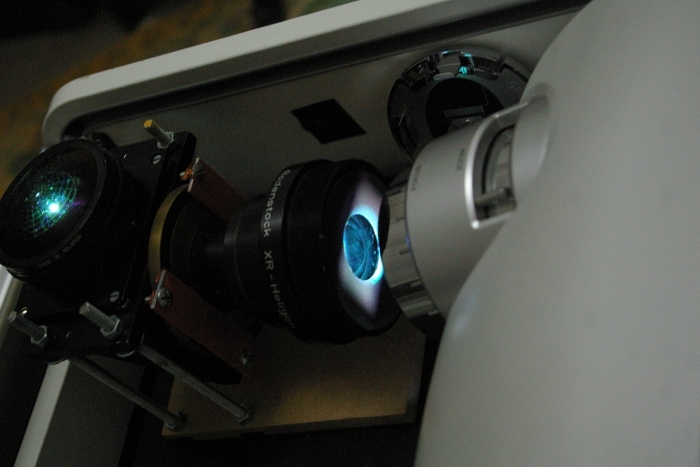 On the system used by the Bressan's planetarium, the ideal diameter is 30 mm. 3. Without the baffle, Try by successive tests the gray area to the southern horizon. To facilitate future adjustments, also display the menu M and alignment of constellations. 4. Gradually decentralize the Baffle up to try to determine the offset necessary. on Bressan's Planetarium, this offset is 4 mm. 5. With appropriate software (eg open office), make some copies with different offsets (center opening offset). 6. If one of the Baffles is satisfactory, the double-felt-to stiffen, and avoid stray reflections. The southern horizon is slightly blurry, the menu text "drools", the stars are imbedded. With the baffle, the text is clearer, the stars are less drooling.